In the world of automotive design, Pininfarina stands as one of the most influential and iconic names in the business. So what happens when you put designers from this legendary firm in the same room as their counterparts over at Bayrische Motoren Werke? You end up with an exclusively styled one-off in the form of the Gran Lusso Coupé. The Gran Lusso Coupé, a first time collaborative effort of the two houses, was shown at the Concorso d’Eleganza Villa d’Este in Italy this past Friday. For those unfamiliar with Pininfarina, the design house was founded by Battista “Pinin” Farina in 1930’s Italy. Ferrari, Maserati, Lancia, Alfa Romeo and others have all been touched, and mostly blessed, by the Pininfarina design. 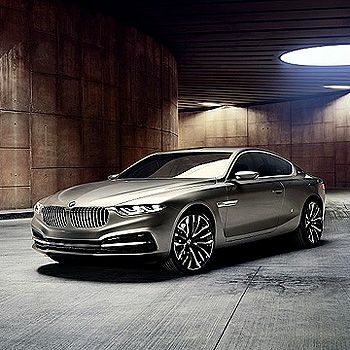 The Gran Lusso Coupé evokes basic BMW design aesthetics throughout, but thanks to Pininfarina the two-door exudes an Italian influenced persona. While clearly working off 6-series architecture, the Gran Lusso is wider and longer than its production brethren with long sweeping lines evident throughout, including a flaring hoodline that carries over and through into the windscreen. This singular detail then flows up and over a swept roofline and narrows down around the inset rear window and onto the shortened decklid. The tail end of the Gran Lusso is also very much Pininfarina with its ultra slim, minimalistic tail bar that wraps around high on the rear end. The bumper treatment starts and finishes out back, unlike the 6 where it carries over from the rear haunches. On profile, one of the more distinguishing elements is what BMW describes as a “countersweep.” This bevel emboss feature starts at the air breather behind the front wheel, then scallops its way aft where it tapers into the rear wheel well. This incongruous feature looks to come from either a Ferrari 612 Scaglietti or Mercedes SLS and in this context, it seems to detract from the cohesion of the overall design. The interior is replete with a mixture of high grade Italian leathers from the house of Foglizzo. Wood insets are made from kauri, a beautifully grained timber harvested from New Zealand swamps where it has been preserved for nearly 50,000 years. There are no performance, weight or engineering details except for the mention of a V12 residing under the lengthy bonnet. Although there are no plans to produce the Gran Lusso Coupé, there is an expectation that some elements from the Pininfarina/BMW project will find their way into future designs.